Prelude Music Classes for Children - Prelude's Blog - Singing in Tune – Yes, You Can! Singing in Tune – Yes, You Can! Hello, families! Here we are in late July, most of the way through our Summer 3 collection! Each week, I try to remind all the adults in the class to let our voices be free while we’re singing, let our bodies be free while we’re dancing, and (as best you can) let our minds be free of any distractions, worries, or inhibitions while we’re making music in class. As a parent, I am well aware that some of the worries and inhibitions we experience have to do with what we sound like when we sing out loud. Yikes! Do you ever worry that you might be harming your child’s musical ability by singing off-key? Parents who feel or know that they aren’t “good singers” frequently ask us whether they are somehow damaging their child’s capacity to sing. Here’s some good news: you aren’t! Your child is not viewing your singing as a performance; instead, he or she is holistically hearing, seeing, and feeling the musical experience with you as a model. If you’ve been in class for more than a session or two, we hope you’ve absorbed this! As children, many of us had music classes as part of our primary school experience … and some of us were likely instructed to “mouth the words” when performing. And perhaps you internalized the idea that you shouldn’t sing out loud because you weren’t singing in tune. More good news: anyone, regardless of age, can learn to sing in tune (even you!). Like any other skill, maybe it’s one of your strengths, and maybe it’s a weakness – but even if it’s a weakness, that doesn’t mean you're not “talented” or incapable of getting there. Let’s try to escape the pattern whereby only people who are “talented” should be allowed to sing around others – because singing and making music is something that belongs to us all. Like all humans, you were born with an aptitude for music-making, even if you didn’t realize it until you started making music with your own child – who also has innate music aptitude! Often, people don’t sing in tune because they don’t use the larynx muscles that allow a full vocal range. There are strong and weak places in everyone’s voice, just like there are strong and weak places in the rest of your musculature. Sometimes it’s a matter of exercising and using those muscles. Something to try: warm up your voice on the way to class! Go to the highest and lowest places in your vocal register, make a firetruck/ambulance “siren” with your voice, sing the tonal patterns on your Music Together® recordings. With use, those muscles can get stronger and allow you to sing more comfortably. Our recorded music is specifically designed for adults AND young children to be able to sing in an accessible range. This is important for children in particular, because attempting songs that are out of their range can result in singing out of tune. And again, you don’t need to sing perfectly in tune for your child to learn this skill – all you need to do is model the effort and the enjoyment. Wherever you are on your parenting path or on your way to reaching your true musical self, I ask you to remember that it takes practice and patience. The longer you do it, the better you will be! 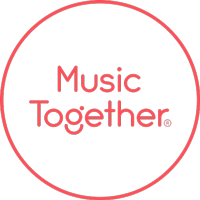 So many parents and caregivers come to us and share how they’ve become better singers through Music Together, just by participating and paying attention to their children’s musical growth. Can this be true for you, too? Registration is now open for the Fall session at our Houston, Sugar Land, and Woodlands locations! Many classes fill up quickly, so reserve your spot now on the Register page. We look forward to another beautiful season of music-making with you and your child!